This simulation demonstrates the difference between a wheel that rolls smoothly, and one that slips. The rotation rate can be adjusted. The red point shows a fixed location on the rim of the wheel. The red vector is its velocity. 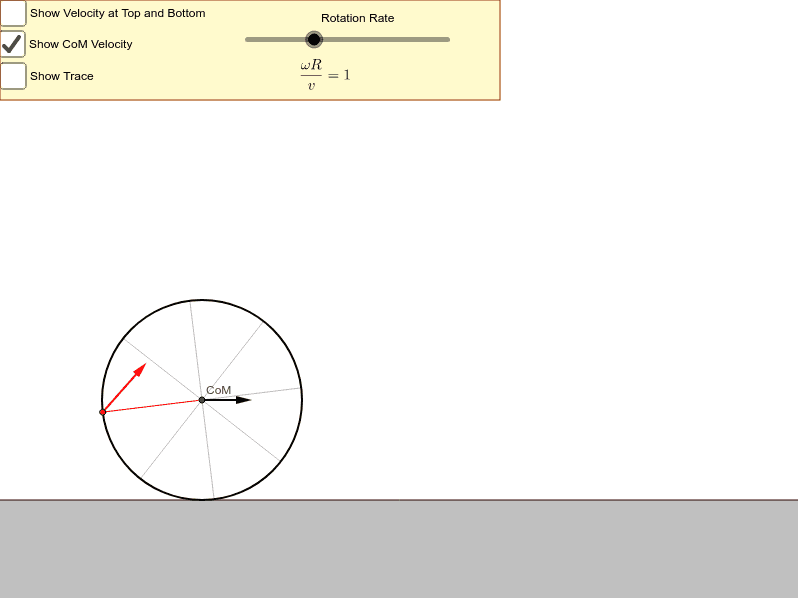 Click the play button in the bottom left corner to watch the wheel roll, and observe how the velocity of the red point changes as it goes around the wheel. When is the magnitude of the velocity of the red point the largest? Are there any cases where the velocity of the red point is zero? How can you tell if the wheel is slipping as it rolls? Friction applies the torque that makes the wheel roll. In what case is the friction kinetic, and in what case is the friction static?